His mind is on the World Series right now, but within weeks, Carlos Beltran's focus will shift to the offseason. The 36-year-old will head into free agency for the third time in his career, this time sporting a .296/.339/.491 batting line with 24 homers in his walk season. Beltran is a dangerous hitter, plain and simple. Over the past eight seasons, he's averaged a 135 OPS+ and 31 homers per 162 games, and he posted a 128 OPS+ in 2013. Among qualified free agent position players, only Robinson Cano, Marlon Byrd and Shin-Soo Choo have a higher wRC+ than Beltran's 132 (and Byrd, of course, is no lock to repeat that feat). Based on those numbers, Beltran was somewhere between 28 and 32 percent better than a league-average hitter this season. For someone with so much power, Beltran is actually pretty difficult to strike out. He whiffed in just 15 percent of his plate appearances in 2013 — a mark that was bested by only Nate McLouth and Jacoby Ellsbury among free agent outfielders (assuming, of course, that Coco Crisp's option is exercised). Interested parties can land Beltran's strong production for a fraction of the price that Choo will command as a free agent or Hunter Pence commanded in his extension. The largest deal Beltran could realistically hope for would likely be for three years, and even that's a stretch, given his age. In that regard, the fact that he turns 37 next April is actually somewhat of a positive. Beltran has a reputation for being injury prone, but he's played in at least 140 games in 12 of 15 seasons dating back to 2001. He's averaged 146 games over the past three years, quieting those who thought he was finished after playing in just 145 total games from 2009-10. A move to the American League, where he could DH occasionally, would likely keep him in the lineup even more often. Beltran's camp can also point to his lifetime .337/.449/.724 postseason slash line and 16 homers in just 45 playoff games. The other side of the coin for Beltran's age is that committing multiple years to a player that's about to turn 37 is a risk, especially one who comes with Beltran's injury history. Players break down in their older age, and it's not as if Beltran is without signs of decline. After walking in just over 13 percent of his plate appearances from 2008-09, Beltran's walk rate dipped to about 12 percent from 2010-11, then 10.5 percent in 2012 before plummeting to 6.3 percent in 2013. The resulting .339 OBP was his lowest mark since 2005. He also showed an uncharacteristic platoon split in 2013, hitting lefties at just a .252/.281/.448 clip. Defensively, Beltran has graded out below average for several years now, but 2013 was particularly unsightly. Beltran's -18.7 UZR/150 was fourth-lowest among all qualified position players, and The Fielding Bible's assessment of -6 defensive runs saved, while an improvement, isn't much of an endorsement either. 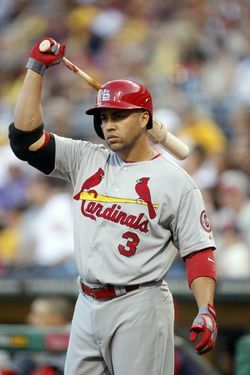 Beltran is a candidate to receive a $14.1MM qualifying offer from the Cardinals, which could damage his market as well. Teams will like his overall offensive package, but there's enough risk in committing dollars and years to a 37-year-old with declining plate discipline and defensive skills that the loss of a first- or second-round pick may cause some teams to back off. Carlos and his wife Jessica are prolific community activists. Beltran's passion for education led to the founding of the Carlos Beltran Baseball Academy in his native Puerto Rico. The academy is a high school for the island's top baseball prospects and places an emphasis on teaching them English — an opportunity Beltran didn't have prior to being drafted. Beltran has been active within the New York and St. Louis communities as well, recently starting a scholarship fund in St. Louis that provides eight underprivileged Hispanic youths with college scholarships. On the field, he's seen as a leader by his teammates and enjoys offering advice on hitting and outfield positioning. Carlos and Jessica have two daughters and make their offseason home in Puerto Rico. The Cardinals have Oscar Taveras as the heir-apparent in right field, though they could put Taveras in center and attempt to retain Beltran as their right fielder. That move would push Jon Jay out of the picture and make him a trade candidate, as someone would likely still want him around at his projected $4.4MM salary. While many teams in the National League will still show interest, an AL team would probably be willing to offer Beltran more money knowing that they could stash him at DH on at least a part-time basis. Beltran's already been connected to the Yankees, as there's reportedly mutual interest between the two parties. Beyond that, the Royals' black hole in right field could lead to interest in a reunion. The Rangers and Orioles are two more teams that have question marks at corner outfield spots as well as in their respective designated hitter roles. The Rays could use more offense, but he's likely to be too pricey for their budget. Plus, playing 90 games on artificial turf between Tropicana Field and the road trips to the Rogers Centre probably isn't in the best interest for an aging outfielder with a history of knee issues. Agent Dan Lozano of the MVP Sports Group could start out seeking three years for Beltran, given his strong offensive numbers. Lozano can pitch to AL teams that some extra time at DH will keep Beltran's bat in the lineup and could boost his homer total back over 30, but three-year deals for players of Beltran's age are few and far between. Raul Ibanez managed to land one from the Phillies, but that proved to be an ill-fated deal by its completion, and Beltran would certainly require more than the $10.5MM annual value that Ibanez received. Beltran's two-year, $26MM contract with the Cards helped set the bar for aging veterans like Torii Hunter, Chase Utley and David Ortiz. I'd expect that he can sign a similar contract this time around, perhaps with a slight raise given his overall solid production in St. Louis. A two-year, $30MM contract would give Beltran nearly the same guarantee that Ibanez received over his three-year deal while minimizing the risk, in terms of contract length, for the signing team.